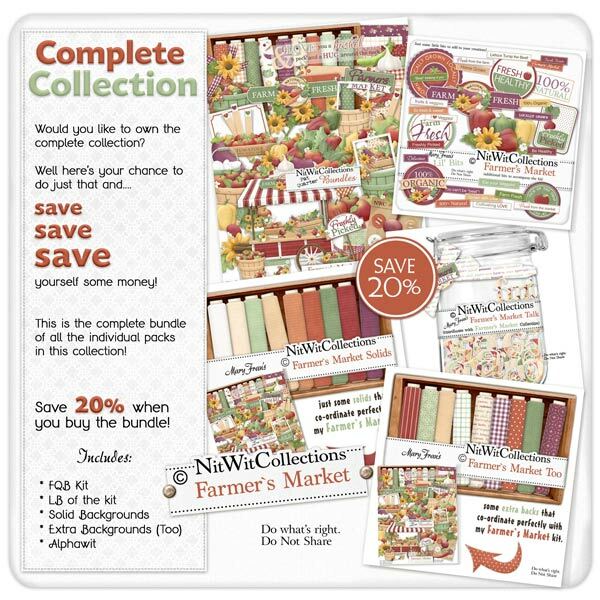 Our "Farmer's Market" Collection is ripe for the picking and ready for your digital scrapbooking layout and card making ideas!! Filled with bushels and crates of luscious vegetables and fruit you are on your way to "selling" your creations to your loved ones. The colour palette is so pleasing in the red and green tones and the fresh look of all the elements will hopefully make your mouth water. Now think outside the box a little as well.....could you use this kit for an office party, family photo or invitation about "all the good apples" or perhaps it is a get well wish using the healthy garlic to show off its healing properties. Keep thinking and we know you will "unearth" many opportunities to create with this kit!